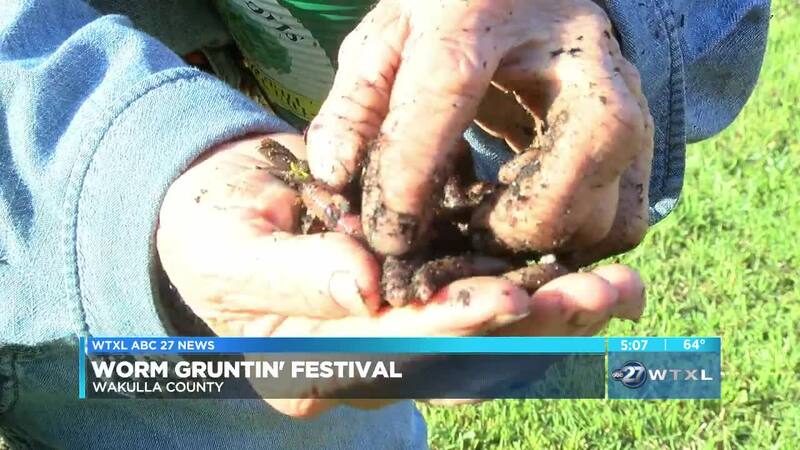 Festival kicks off Saturday at 7 a.m.
WAKULLA COUNTY, Fla. (WTXL) — We've all heard the saying 'the early bird gets the worms,' but in Sopchoppy, Florida that's more than just a figure of speech. "Numerous people and families made a living from it," said Nelson Martin, Worm Grunter. "We're trying to imitate a mole in the ground." To be a worm grunter, all you need is a strong piece of wood and some iron. THose vibrations will bring up worms like this one from a 30 foot diameter. The technique is so popular in this community, that there's now a festival to show it off. "We have easily ten thousand people show up," said Susan Solburg. The festival focuses on what makes worm gruntin and Sopchoppy so unique. "Too many people forget about the traditional things that have been around forever," said Solburg. While worm gruntin isn't as popular as it used to be. Martin says "In the 70's, plastic worms kind of put an end to the industry." Here in Wakulla County, if you listen closely, you'll likely hear the early bird catching the worm. That festival is Saturday at the Train Depot in Sopchoppy. It starts at 7 in the morning and lasts all day long.